Roosevelt Avenue is home to thriving entrepreneurs from all over the world; small business owners seeking to help people like themselves find a place in the city. This hyper-diverse landscape seems to “become transformed into a Latin American city on weekends, although not one city in particular” as it has emerged as its own unique landscape (Miyares, p.477). Although some business types dominant the landscape, Roosevelt Avenue truly is a one-stop shop with supermarkets, specialty import and music stores, beauty supply and unisex salons, restaurants serving traditional food of Ecuador, Peru and Mexico, outlets for clothing, shoes and jewelry as well as a large percentage of lawyers, attorneys, travel agents and other services dedicated to serving the immigrant populations’ needs. While conducting a cultural landscape analysis of Roosevelt Avenue, the emphasis was placed on business-type, density and distribution. 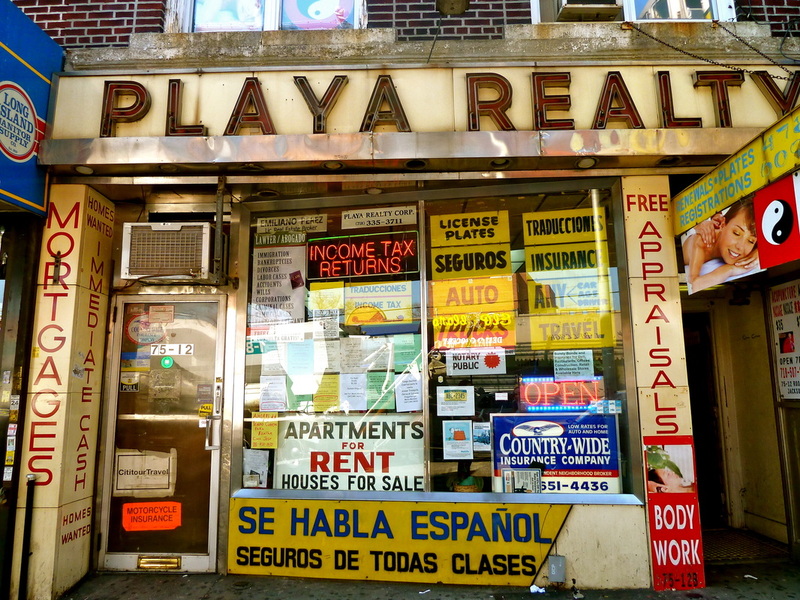 After observing both sides of the commercial landscape of Roosevelt Avenue from 74th Street through 86th Street, specific business addresses were recorded, photographed and eventually categorized into ten general business types. Out of 94 businesses recorded during the commercial analysis, 34 businesses, nearly 36%, were categorized as immigrant services- the largest distribution out of all ten different business types. The term ‘immigrant services’ is a title placed on the various services that help out recent arrivals gain foot in their new country as well as maintaining transnational connections. Many stores help preserve trans nationality by offering multiple services under one roof including international telephone calling and cellular service, sending of money order remittances (see Figure 2), currency conversion as well as travel agencies to arrange further travel in and out of the country (Miyares, p.479). Although Miyares describes the many services that seek to help immigrants stay connected to their host country, there is an entire other outlook on services that seeks to help immigrants adjust to life in Jackson Heights such as housing and employment, tax filing, insurance, driver’s licenses, English lessons and a wide range of lawyer services (Figure 3). Often these businesses do not just fulfill one service, rather most services are provided from one property to satisfy all services in a ‘one-stop-shop’ atmosphere for the customer (see Figure 4). One would think that because these businesses provide multiple services under one roof that there would be fewer; however, just the opposite is true and these service centers dominate the commercial landscape of Roosevelt Avenue. Compromising more than a third of the businesses distributed in the commercial district, places of ‘immigrant services’ provide insight into Roosevelt Avenue asa ‘starting point’- a place where new immigrants can come and gain cultural capital in order to successfully integrate into the New York City landscape with the help of older generations of immigrants, while simultaneously benefitting from the affordable housing and accessible public transportation. Employment is another magnet to Jackson Heights, “coethnics from whom job information can be obtained as well as the presence of ethnic economies are also continuing draws to the neighborhood” (Miyares, p.476).